Don’t you love it when you find something that fits perfectly? It always brings a smile to my face. I especially love being surprised by a perfect find, that’s even better. I know it’s going to sound contrived but that’s how it went with The Sparkle Box. I knew it looked like it would be good, but then I read it and it was perfect. Let me explain. 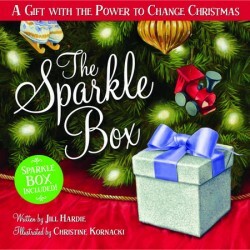 The Sparkle Box by Jill Hardie is a book about a family and their little boy, Sam. Sam is eager for Christmas and he’s curious about a mysterious box his mom has added to their fireplace mantel. Sam wonders what is inside the sparkly box but his mom tells him to wait until Christmas morning. As he waits, Sam and his family continue to serve their community in various ways. And what Sam finds in the box on Christmas morning is a reminder of how we best serve and love Christ during the holiday season – that is, serving others. The book also comes with a Sparkle Box you can assemble and add a bow to – or you can make your own to start your own Sparkle Box tradition. The story itself was sweet and the kids really enjoyed it. They were especially thrilled to find the Sparkle Box in the back of the book. Three years ago we made a change to our Gifts of the Magi tradition, turning our Gold gift, our gift of value and treasure, into a gift that we give, a gift of spiritual value. On Christmas morning, our little gold-wrapped box holds ornaments that represent the charity that the children and I chose for that year. But the truth is, the charity we choose for the gold gift isn’t the only way that we serve and give during the holidays – there are other things, too. We also make food donations and other things. In comes the Sparkle Box! If I merge these two together, the Sparkle Box can sit on our shelf collecting our other “gifts” until Christmas Eve and then I can add our ornaments and place it under the tree. So now our Sparkle Box (complete with gold bow) sits on the shelf next to the Advent Candle Wreath. It already has a few strips of paper in it, and it’s waiting for more. What will you do with your sparkle box? 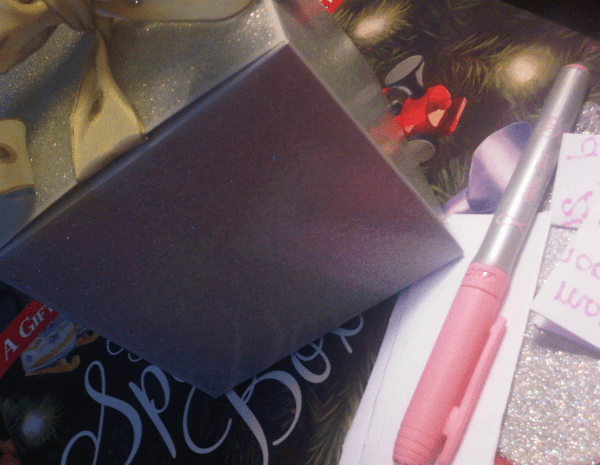 Ideals Books is giving away 2 copies of The Sparkle Box for the Mommy Time Party, Dec 4th and helping me bless a couple of moms this holiday season. The giveaway will go live here on this post when the Mommy Time Party begins at 8PM Eastern. Until then you can find The Sparkle Box online and on the Ideals Books website. A special thanks to Ideals Books for helping me bless a couple of moms by providing the two books to giveaway at the Mommy Time Party. I also received a complimentary copy for myself and chose to write a brief review of our experience and pleasure with The Sparkle Box. Leave a Comment! Tell Me What You Think. Prevents spam comments, and consents to store comment data. My favorite giving tradition is having the kids pick out a gift to give to another famiy….a goat, chicken, cow, etc through one of the Christian ministries that provide this opportunity. Our kids draw one of their siblings names and then they purchase or make a gift for them to be exchanged on Christmas Eve. Truly sweet memories have come from this and I love watching them pick out their gifts for their brother or sister. 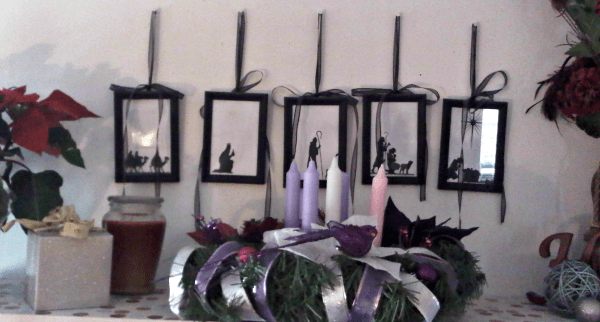 favorite giving tradition is something homemade with a photo…..
We don’t really have any “giving traditions” yet. Hoping to start some new traditions this year! This year we’re going to make cookies for the neighbors. My children are 3, 2, and 7 months, so we’re just starting our own traditions. We gave storybook bibles to young families last year anonymously. Sadly, we don’t have a giving tradition. Although, I hope to remedy this soon. My kids are putting together a box of clothes that we will be donating… it’s a start. We don’t have a giving “tradition”. Putting together Operation Christmas Child boxes. ~ btw, this past Sunday our pastor introduced us to the Sparkle Box. In Sunday school all the children made their very own Sparkle Boxes. Instead of buying a copy from Amazon, it sure would be nice to win it from you! Each year around Christmas, our Campfire group donates clothes and toys to a local children’s home. I love giving my time to each of my family members individually this time of year. I love to give homemade gifts. One of the easiest that the kids can do is spiced tea made with Tang. We make a big batch and scoop about 1/2 cup of mix into a bag tie it up, put it in a pretty Christmas Mug. We don’t have traditions yet, but I just heard about The Sparle Box and would to read it! Our favorite giving tradition is Operation Shoebox Christmas. My five-year-old daughter enjoyed choosing gifts to send. 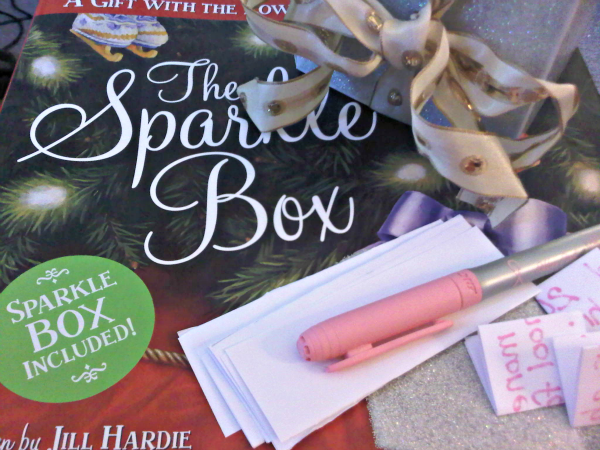 I would love to win The Sparkle Box book. It looks like wonderful book to read. Thank you for hosting this giveaway.